The arrival of a new baby can turn a household on its head and it could also affect the house pets. Once the new baby has come home, it is accompanied by an overwhelming array of new sounds and smells, and this could upset a dog, especially if it is not used to children. A baby also results in drastic changes to the daily routine, which means that your dog’s schedule could possibly also change. A new baby could also result in a dog getting less attention than before for a while. All this can result in tension between the dog, the baby and the rest of the family. Separation anxiety can result in the dog showing destructive behaviour such as chewing or tearing things, excessive barking or howling, or messing in the house. Some dog breeds handle children better than others by nature, but it is possible to take certain steps to make the dog used to the new baby. According to experts your dog will probably become aware that something is going on during the pregnancy. This does not mean, however, that the dog knows what to expect. The well-known dog whisperer Cesar Millan, says it is important to get professional help immediately if the dog shows serious behavioural problems with the arrival of a new baby. Millan’s advice is that you start preparing your dog for the arrival of the new baby. According to him it is of cardinal importance at this stage to maintain strict discipline and to let the dog clearly understand the rules, boundaries and restrictions. You could, for instance, even before the arrival of the baby, lay out a playing area for the baby and put a cot somewhere in the house. Teach the dog that these areas are for the baby and not for the dog. According to Millan it is also very important to control the dog’s excitement as even a small dog can seriously injure a baby if the dog gets too excited. A baby changes a whole family’s routine and is also going to change the dog’s routine. You should therefore try to prepare the dog for probable changes before the arrival of the baby. If mom usually took the dog for a walk but will not be able to do so owing to the baby’s arrival, dad or somebody else should do it in the meantime to make the dog used to it. It would also be wise to buy a pram in the meantime so that you and the dog can go for a walk with the empty pram to familiarise the dog with it. According to Millan you could also play recordings of a baby crying before the baby’s arrival to see how it affects the dog’s behaviour so that you can start working on it before the baby comes home. It would also help to introduce your dog to children before the baby’s arrival if it is not yet used to children. When at last the baby has arrived, take an item home with which the baby was in contact in hospital so that the dog can get used to the baby’s smell. When the dog and the baby eventually meet each other, it is essential that you control the meeting. Millan suggests taking the dog for a long walk so that it comes home tired. The dog must be allowed to smell the baby, but from an acceptable distance. Millan suggests that the dog should not be allowed to get too close to the baby the first time and should gradually move closer and closer. 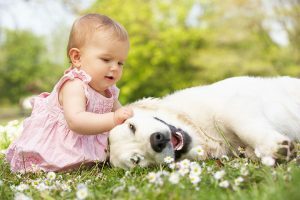 When the baby can crawl and starts exploring, it is essential that the baby should also be taught how to handle dogs so that there is mutual respect. The most important thing is not to push the dog away and to maintain its routine in order to make sure that your dog is calm about the new addition to the family.